Meet our guide at the border post of Sob Hun then direction to Meuang Khoua. Pending of the available time after your arrival, you will visit villages along the road. Arrive in Meuang Khoua, enjoy a city tour, then transfer to your hotel. Today we will go direction to Hat Sa, located about 105km away (6 hours by boat). First real immersion in the typical Laos. The Mekong River is integral to the lives of Laotians, this cruise will introduce you to different facets of this beautiful country. After arrival in Hat Sa, prepare for the start of the hike the next day to Phongsali. City tour and overnight stay. We start walking from the town of Phongsali, heading towards Khounsouknoy Ban (village of the tribe Phounoys). This village is famous for the production of the green Lao whisky (Lao Lao). We continue walking along the river Nam Long and we take the path made by French soldiers during the Vietnam War. Picnic at Nam Long and after lunch we take a path through thick jungle, and wet rice fields. After a long day of walking, we arrive at Ban Changtern (Akha tribe village) where we spend the night in the home of a village family. After breakfast we start walking towards Ban Peryenxangmai and Ban Sopngam and we will walk along the mountain ridges. Enjoy the picturesque landscapes, cross the jungle and bamboo forests to arrive at Ban Sopngam (Laoseng tribe). After visiting Ban Sopngam we continue hiking up the mountain area, were we will have lunch at the summit the highest peak. Today we spend the night with families of Ban Peryenxangmai. Walking Time: 5 to 6 hours. After breakfast we will head to two Akha tribe villages (Ban Peryenxang and Ban Chakhampa). Our journey will pass through a young forest surrounded by rice fields. After lunch taken at Ban Peryenxang we will reach Ban Chakhampa and spend the night in the village. Walking Time: 3 to 4 hours. After breakfast we will have time to visit the beautiful surroundings of the village and see the wonderful and endless mountains around. Then we begin the hike along the trail following the Nam Ou River, we will take a private boat to reach Hatsa. After lunch, we will take the bus to Phongsaly. City tour of Phongsaly depending on time of arrival. Trekking Time: about 3 hours. Starting Phongsali direction to Boun Tai. The route is in few places in a poor condition, so we will do several stops along the way. You'll discover traditional villages in a region still little traveled by tourists. Later you will reach Ban Gnay Neua, where different lifestyles and more minorities are met. Our next stop is the village of Ban Yo, an ethnic village called Iko Iko again belonging to the Akha tribe meaning "Older Brother" in Lao. The women of the tribe Iko are experts in weaving, knitting and decorative sewing, while men are excellent woodcarvers. Finally, before arriving at Boun Tai, we visit a village Yao Yao where houses usually made of wood or bamboo, with a rectangular shape and a dirt floor. Night at Ban Boun Tai. Breakfast and then visit Ban Boun Tai. Leaving Ban Boun Tai to Oudomxai. En route we will cross many small villages, we will stop to enjoy the tranquility and the friendliness that exist. After the visit of Oudomxai direction the Muang Resort for the night. Night in the Muang La Resort (enchanting lodge), guesthouses or homestay. After these long days of walking, this one will be devoted to relaxation. Enjoy more swimming in natural hot springs and natural waterfalls, surrounded by an idyllic setting. Opportunity to explore the area in a short hike for those interested. By mid afternoon we leave the paradise setting of Muang La and go towards Nong Khiaw. Lao people uses the Mekong as a transportation network in its own right. It is through this that we will reach Luang Prabang, a city world heritage site of UNESCO. 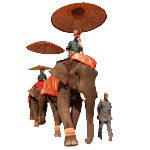 Arrived in Luang Prabang, transfer to your hotel and evening free to join a magnificent night in Luang Prabang. Awakening at dawn to see the most impressive activity of Luang Prabang, the alms of the monks: the monks walking along the street and collecting the people's food offerings. Then visit the old city: Vat Vixoune influenced by architecture "Tai Lu," Makmo, the stupa-shaped watermelon and Vat Aham just next door. You will continue to Vat Sipphoutthabat, its beautiful carved doors and views over the Nam Khan River. Walk through the narrow streets to Wat Xieng Thong, the most beautiful temple of Luang Prabang, from the 16th century. In the afternoon we will visit the National Museum, the Old Royal Palace and Wat Mai with five levels and a magnificent carved veranda. In the heart of the city, we will climb the Phousy mount to have a wonderfull view of Luang Prabang and the surrounding mountains. You will then have free time to explore the night market in Luang Prabang. Free time until transfer to airport for your return flight.